You should start paying attention to kayak paddles from today because they will make your kayaking trips a lot more relaxing and gracious. Besides the kayak itself, this should be the most essential kayak accessory you should care about. To be honest, most kayakers don’t care about this until the day they have the other better paddles in hands. They could only see the huge difference between the decent paddles and the best ones. By using a good paddle, you can row a lot faster, easier, more smooth, your arms will not get some incredible sores and your palms will not get calloused afterwards. The most crucial thing you need to be aware before purchasing kayak paddles is its size. You want to buy the paddle which have the right length for your kayak and your body (scroll down to the bottom for more details). Each paddle has its own features and lots of perks which will come in handy for different types of kayaking. Below, we will give you the best five paddles for kayak on the market right now. Each comes up with lots of features and pros. And at least one of them will definitely fit your needs. Let’s take a look! Like the next one, Bending Branches Angler Scout is made of aluminum. However, it doesn’t have any grip, so you might want to use gloves during the winter to use this paddle (we still need gloves anyway). This paddle is exclusively designed for anglers. In the other words, it is not designed for long kayaking trips. Thus, the grips are not really needed, helping reduce the price a lot. The handle of the paddle has the fish-o-meter so you can easily measure your caught fishes without carrying extra fishing accessory. This is one of the most beloved features of this paddle. 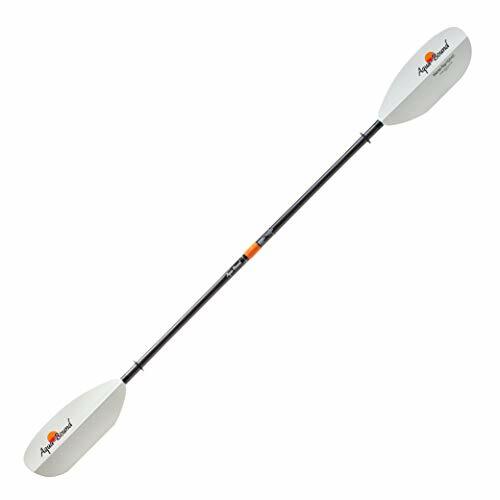 The blades of this paddle is made from fiberglass, making it even a lot more lighter, allowing you to save more energy for the other activities. The other fishing perk you might love is the hook retrieval system of the blade. If somehow your line gets stuck on the tree or a big fish gets caught, the blade can be used to support your line in different ways. This kayak paddle is very height friendly. It comes with a lot of sizes for you to choose: 220, 230, 240, 250, 260 cm. Regardless of your height, you always can find a perfect size for you. Lastly, the Bending Branches Angler Scout is 100% made in the USA with the best standard on the work, making it one of the best choices on the market right now. Lots of sizes to choose. Although the SeaSense X-1 is made from aluminum, it is not heavy as you might think. 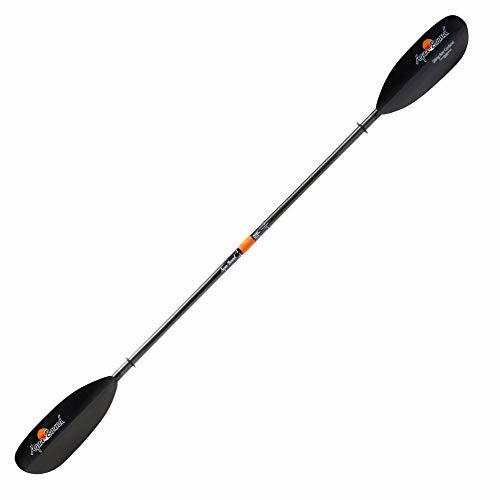 The SeaSense X-1 paddle has the length of 84 inches, which is ideal for everyone around 6′. If you are taller than average, consider purchasing a 96″ paddle. In addition, make sure its length is suitable with your kayak. Also, because the aluminum is extremely cold in the winter, there are pads equipped on the paddle to make sure your hands will not be touching the aluminum during those cold days. Although the grips are made from foam, they don’t wear down too fast over time. You can replace those grips easily If needed. However, normally it should be still good after years. Besides, the grips are adjustable. You can easily move and use them with ease, giving you the maximum comfortable while kayaking. This is one of the most beloved features of this paddle. Some other paddles don’t have any paddle because it is not made from aluminum, you would notice this later. Its blades are made from plastic, which helps reduce the weight of the paddle a lot. Everything should be fine If you are a beginner. However, in the first kayaking trips, don’t paddle for too long at once, take a break for like every 15 minutes so you won’t get fatigued fast. Last but not least, the SeaSense X-1 floats so it’s impossible to lose it in the water. You can easily grab it back easily If you unluckily drop it while paddling. Perfect for people with average height. Foam grips are normally not as good after years. A bit heavier than the others. 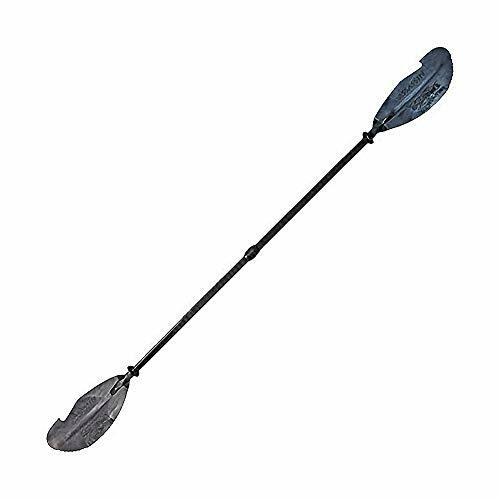 Aqua Bound Sting Ray Carbon Posi-Lok is an outstanding fishing paddle which is made from Carbon, one of the best materials for making paddles and kayaks. Because it’s carbon, your hands will always stay warm and your arms will never get hurt. It absolutely doesn’t absorb the temperature around. It’s also super lightweight, making it the best paddle for beginners. Being made from carbon is the most amazing feature of this paddle. The well designed blades help you paddle effortless and get the the speed you want with ease. Like the other ones on this list, this paddle is made in the USA, this should be another factor most kayakers should pay attention to. The Aqua Bound Sting Ray Carbon Posi-Lok comes up with various sizes: 210 cm, 220 cm, 240 cm and 250 cm, making it super easy to pick a perfect one for your body and your kayak. If you really care about speed, you will love it because the feather of this paddle is adjustable. Like most of the other paddles, you can split it into two parts with just a twist so you can easily store it when not in use. This features the notable Posi-Lok ferrule system of Aqua Bound. Acceptable price for the quality. Repeatedly, we have to feature another carbon paddle because “who doesn’t love carbon?”. This should be the ultimate material for all kayak paddles. Like the other carbon paddles, the Werner Camano Straight is surprisingly lightweight, making your kayaking trip a lot easier and relaxing. The carbon prevents your hands from losing heat and getting cold in the winter, as well as keeps it dry during the trip. With the carbon sharp, you really don’t need to care about grips. The blade is made from fiberglass with a very interesting design, giving it the maximum flexibility and sturdiness while in the water. The blade design is high angle, helping you paddle with the maximum possible speed, reducing the water resistance. This design might not be friendly to new kayakers at first, however it shouldn’t be a cons. You will get used to it in just a trip! Like other best-selling paddles, this one can be split into 2 pieces, making storing and transporting it a lot easier when not in used. There are various versions of this paddle with different lengths. Make sure you pick the right one that fits your body and your kayak as well. It shouldn’t be too short as well as too long. However, If your kayak is not anything special, you can just purchase the 250 cm version. A note we want to mention here is that you shouldn’t use this paddle with rapid waters. 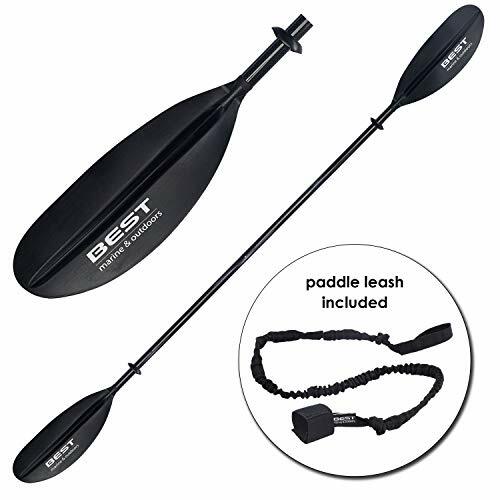 It is designed for using in flat waters like lakes or rivers! Blades are made from fiberglass. Can be split into two pieces. Not great for rapid waters. Similar to the Aqua Bound Sting Ray above, The Seattle Sports SeaWhisper sharp is totally made from carbon, one of the best materials for making paddles. It helps your hands stay warm and indefatigable in the winter. Nevertheless, Its blades are made from plastic, making it a bit heavier than the normal aluminium paddles. Thus, you shouldn’t really purchase this one If you are a beginner or If you usually have long kayaking trips. The feather of this paddle is adjustable via the cam-lock ferrule, which will come in handy whenever you want to boost your kayaking speed. However, If you are not an expert and don’t care about speed too much, just keep it as default! 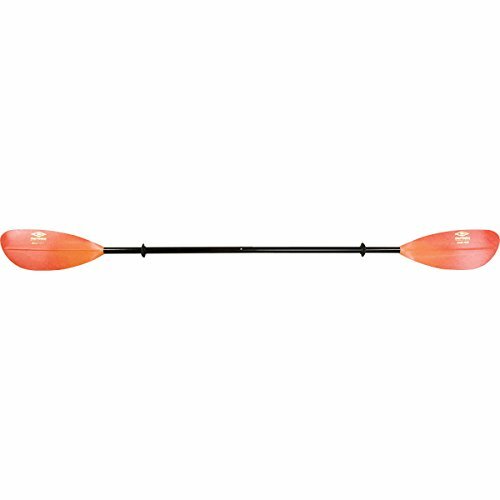 One of the most interesting features of this kayak paddle is that it allows you to adjust the length with ease. You can pull it to change the length from 230 cm to 240 cm, so your friends can use it with ease. This paddle’s blade has one of the best designs on the market right now, it’s the dorsal blade. This really helps you row faster without getting too much resistance from the water. There is a small hook on the blades which can be used to snag items with ease. At last, we really like this small but extremely helpful of this paddle. It is it allows you to attach it to your hand by using the integrated leash loop. Thus, you will never loose it while rowing no matter what happens. You can rarely find this feature on other products. All in all, this is definitely an outstanding product for almost every kayaker! Paddle shaft is made from Carbon. Length and feather are adjustable. There are literally thousands of paddles on the market right now for you to choose. So how to pick the best ones out of them? Here are some of the most important factors you might want to consider before purchasing one. As a beginner, you might not pay too much attention to the paddle angles. 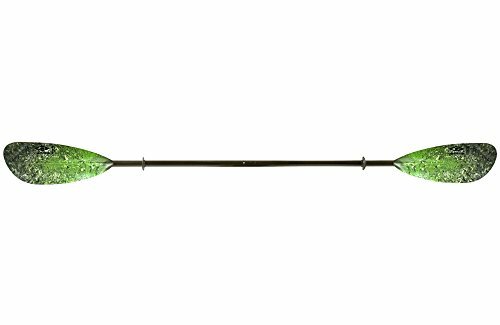 However, it is extremely crucial to buy ones with suitable paddle angles as they will definitely help you move a lot faster and easier. Most experts like ones which have a dip on the blade, which is called wing-shaped paddle. This helps them get to the max speed with ease. But If you don’t care about the speed too much or you are a beginner, you might not really want to use it as using this kind of paddle is not really easy. If your kayaking trips are most of the time on flat waters like river or lakes, you can just buy ones with high angle. They will help you shred through the water much easier. Low-angle blade paddles are best for new users as they take less energy to use while still providing great speed. Normal paddles could be drifting while in the water, making using them a bit harder. To prevent this and allow the water flow over your blades easier, pick the paddles which have dihedral or dorsal blades. Dihedral are perfect for beginners. The next factor is the feather. How well your paddle can handle the wind? Seems not really important, however, it does If you are an experienced kayaker. You don’t want the air to cause a lot of resistance to your paddle, which directly affects your speed. If a blade of your paddle has a different angle, it’s called feathering. Manufactures don’t create those blades randomly. They carefully test everything to give out the best form, which can cut through the air efficiently. If you care about speed, and you are an experienced kayaker, you will need to do some rotations with your paddles while rowing with it. This is while this factor is not really important for beginners. Most of the best kayak paddles allow you to split them into 2 pieces so you can easily store them when not in use or carry them easier. This is especially ideal If you use multiple paddles at once and want to store the others while using one. It is also ideal If your kayak doesn’t have enough storage, making transporting them all easier. Either way, paddles which can split into 2 pieces are also the best. In addition, most kayaks, which have adjustable features, are 2 pieces. Cheap paddles can’t be made from high quality materials. Also, most of you, who are reading this guide, might be beginners, so you don’t need to purchase the very expensive ones. We recommend the decent ones with reasonable prices but still provide a high quality. The most affordable paddles in our list are made from aluminum. They are usually very cold in the winter (but no worries, they always come with grips) and heavier than the others. They are not the best choice for new people. Plastic paddles are also pretty cheap, which are more suitable for beginners. They are lighter, easier to use and prevent your hands from losing temperature in the winter. The only downside is they sometimes get bent while being used in strong waters. Fiberglass and carbon paddles are the most expensive but also the best ones in our list. They are super lightweight, sturdy and can’t be affected by the temperature. Whether you are a beginner or an experienced kayaker, they are the best choices for you and the money. Last but not least, If you love traditional style, you can buy wooden paddles. They are usually very heavy, making you tired in a very short of time. However, they are very sturdy and good for training. You also need to regularly upkeep them to have a good shape. All in all, carbon and fiberglass are the best for everyone! We just can’t stress this enough! Choosing a paddle with ideal length is very easy but important for new kayakers. Mostly, you must pick a paddle which has the length that suitable with your body. If your kayak’s width is over 25 inches, buy paddles which are longer than 240 cm. Buy the shorter ones If your kayak’s width is under 25″. If you are taller than the average, buy ones that are longer than normal. If you are taller than 6′, buy ones that are over 102″ (260 centimeters) for the best experience. It should be fine If you use a shorter paddle, but the right one will give you the best kayaking experience. The grips are ideal If your kayak paddles are made from aluminum or wood. If they are made from plastic, fiberglass or carbon, grips are not really needed. If your hands are sensitive or you have any issue with arthritis, pads are always excellent. Hopefully after reading our best paddle reviews for your kayak, you have found some great ones for you, your friends and your family. Consider all of the factors we mentioned above before purchasing anything. It should help you pick out the best ones. If you have any question, or If you have any great recommendation, don’t hesitate to comment below and let us know!